SEATTLE – The fortunes of college basketball teams, even top five programs, can change in a hurry. Gonzaga and moreso Washington are prime examples. The 12th-ranked Zags (7-2) were humming along and climbing in the polls until they ran into No. 4 Villanova in Madison Square Garden on Tuesday. It changed in a New York minute as the Wildcats dominated in an 88-72 victory. The Huskies were off to a 6-2 start with less-than-convincing wins over opponents they were expected to beat and a pair of losses to Power 5 foes. They trailed Virginia Tech by 34 points in the second half. But they flipped the switch and handled No. 2 Kansas 74-65 on Wednesday in Kansas City for the program’s first win over a top two team away from Seattle. Analytics guru Ken Pomeroy labeled it the biggest upset of the young season, which includes Florida’s pratfall at home against Loyola Chicago and No. 1 Duke’s road loss to Boston College. Gonzaga’s and Washington’s most recent outcomes changed the narrative leading up to Sunday’s matchup. A week ago, the general consensus was that the Zags would be heavily favored to extend two decades of dominance in the series (10 wins in the last 11 games, nine by double digits). Now, they enter licking their wounds and facing their first road test of the season. The Huskies’ confidence is soaring and they’ll be emboldened by a pro-UW crowd inside 10,000-seat Hec Edmundson Pavilion. Gonzaga coach Mark Few cautioned months ago that there would be bumps in the regular-season journey as numerous players assumed more prominent roles. The Zags have had at least 15 turnovers in three of their last four games and opponents have dialed in from distance, beginning with Florida’s 17-of-36 effort in Portland. Four of GU’s last five opponents have made at least 47 percent of their 3-pointers. “When you schedule like this and play games like this, you’re putting your team out there,” Few said, following the Villanova loss. “I told them after the game we have to start valuing these little things. It just really hurt us on the details. Jaylen Nowell, following in a long line of UW freshmen standouts, averages a team-high 17.8 points. He’s only made 26 percent of his 3-pointers but he’s been strong inside the arc (58 percent on 2-point attempts). Junior forward Noah Dickerson has three double-doubles, including 13 points and 14 boards against Kansas. The 6-foot-8, 255-pounder makes 62 percent of his shots and averages 16 points and 8.7 rebounds. Junior guard Matisse Thybulle has started every game (74) of his career. He hit five 3s versus Kansas and leads the Pac-12 in steals at 3.3 per game. Junior point guard David Crisp had seven assists against the Jayhawks and ranks seventh in program history with 145 career 3-pointers. 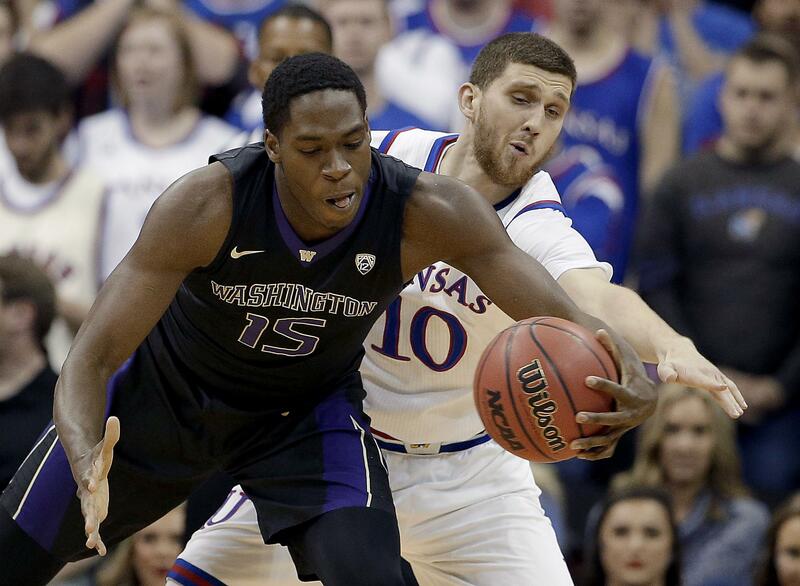 Nowell, Dickerson, Thybulle and Crisp combined for 59 of Washington’s 74 points versus Kansas. Gonzaga freshman Corey Kispert continues to improve from an ankle injury that has sidelined him the last two games. The former standout at King’s High, located about 12 miles from Hec Ed, will be a game-time decision. Published: Dec. 9, 2017, 8:10 p.m.